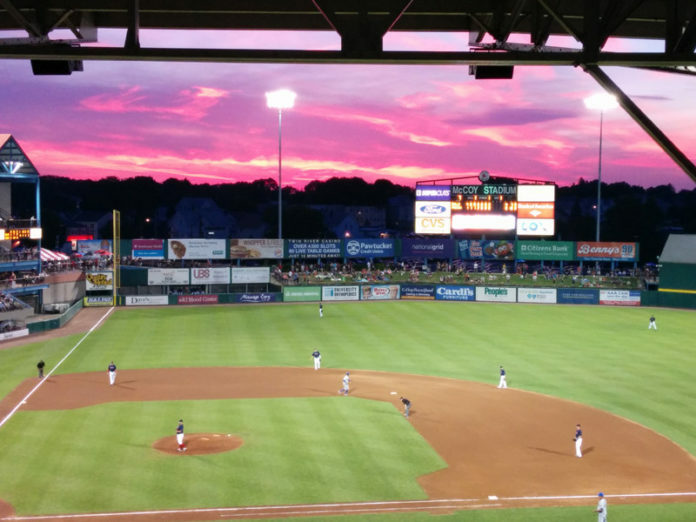 Next articleConventions bring biz prospects to R.I.
Rhode Island and Pawtucket should propose three projects to stimulate economic development around McCoy Stadium. Make plans for a bike path connection between McCoy Stadium and the East Bay Bike Path at the Washington Bridge in East Providence using the P&W rail right of way. Provide funding to make McCoy Stadium Fenway North by building a “Green Monster” wall in left field, bleacher seating in center field and pitcher bull pens in right field. Ask for federal funding to connect the existing and still operating 1.5 mile P&W rail right of way to the main Amtrak right of way to Boston. This would make a MBTA Commuter Rail Station adjacent to McCoy Stadium possible. There has been talk about building a MBTA Commuter Rail Station in Pawtucket. Why not at McCoy Stadium which is a central location with plenty of parking. The MBTA is planning to spend billions of dollars improving their commuter rail systems to improve their chances for a successful Olympic bid. Pawtucket is behind the eight ball on this project for twol basic reasons. First, the city has failed to attract private risk capital to the city for any developments. How often have we heard about modest development projects along the riverfront only to see that nothing happens. Second, the area around McCoy lacks diversity of use and is basically unattractive, and to change that would require a multi faceted plan (something much more than a MTA stop) involving massive investment dollars. If you can’t do modest, how can you do large scale developments. Also, given Pawtucket’s inability to attract private capital, much of their proposals involve state funding. That is how McCoy was renovated in the first place. Why would taxpayers want to get involved with such a massive state investment given the Providence option involves much less. Whining that the Pawtucket officials were not given the opportunity to make their case ignores the investment failures of the past. Why would the new Pawsox owners believe anything presented? Why would you go to a city that requires such a large redevelopment project when you can go elsewhere and not face that challenge, and in this game, it’s not only Providence that offers that attractiveness. With a revitalized McCoy Stadium, a new MBTA commuter rail station, a bike path that extended to Bristol and the development of the new Blackstone River Valley National Park, a five star hotel would be perfect for the area around McCoy Stadium. Visitors could stay at the hotel and be able to see a game at McCoy Stadium, tour the new National Park, ride a bike to Bristol and view the historic Bristol Fourth of July Parade, ride a bike to Providence to see a Broadway Play at the Providence Performing Arts Center, commute to Boston to see the Boston Red Sox /Bruins and visit all of Boston’s historic sites and when it is time to go home, these visitors could commute to the new T. F. Green International Airport. Ken B., I get your point. I do understand your desire to keep the status quo. However, everything on your future wish list would require massive PUBLIC investment and years of planning, development and construction (really would be decades given Pawtucket’s history here)…and it all already exists in Providence. Bike path to Bristol, check; RIPTA transit hub, check; Amtrak/MBTA station, check; restaurants, check; hotels, check; historic sites, check; conntection to TF Green and Boston, check! I don’t want to be a wet blanket on you, but it really is hard to take Pawtucket seriously at this stage of the game. To Ken C—Because of the 38 Studios fiasco, Governor Raimondo and the Rhode Island General Assembly will never approve a new stadium that requires land grants, tax breaks or any government financial subsidies. There is no proven fan support for a team in Providence and high ticket prices and parking fees will keep most Pawtucket fans at home. If attendance is low at the new stadium, the new owners of the PawSox will soon be asking Governor Raimondo and the General Assembly for financial aid which will not be given and the new stadium will become a “white elephant”. Providence has all the amenities but the cost to enter the new stadium will be too high. Pawtucket has very few amenities. In spite of this, last year McCoy Stadium drew more fans than 17 of the 30 Triple-A stadiums. When the new MBTA Commuter Rail Station and bike path are built, Boston area fans will be able to commute to McCoy Stadium and Fox Point residents will be able to ride their bikes to McCoy Stadium. Attendance at McCoy Stadium will increase and carbon emissions will decrease.